I possess six different Tarot decks but usually I end up engaging with either one of the classic Rider-Waite, the Sharman-Castelli, or the Mythic Tarot deck. I have had the Thoth deck for more than two years now, but have somehow not ventured into it so far. My friend who has been an inspiration for me to begin exploring the world of Tarot cards gifted me this deck. I have believed his word that it doesn't help to be purposive with the cards. You can't study them like you study for an exam. So for the past two years, I didn't get perturbed by the fact that I was still not using the Thoth deck. It would just 'happen' some day. Aleister Crowley, the creator of this deck, has been described in different ways, each one more interesting than the other. One of these is “the wickedest man in the world! !” I fancy I have a far-fetched connection with this wicked man. In 1905, he was a part of the expedition that attempted to climb Mt. Kangchenjunga. His fellow climber Alexis Pache and three sherpas were caught in an avalanche. Apprarently, Crowley remained sitting calmly in his tent, sipping tea. He later told a newspaper that, “"not over-anxious in the circumstances...to render help. A mountain accident of this sort is one of the things for which I have no sympathy whatever". Now, 73 years later, in 1988, I was a part of an Indian expedition to Kangchenjunga, and stayed for 17 days at the base camp, at a place known as Pache's grave. I have thus walked the same path up the mountain which Crowley did in 1905. So yes, the connection is far-fetched ! I have been wanting to begin my posts about specific cards from the Tarot. To write my first post related to a specific card here, I instinctively picked up the Thoth deck and drew a card for tomorrow. 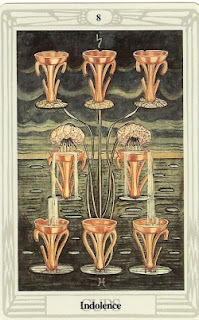 Its the Eight of Cups..... Crowley calls this card 'Indolence'. So what is this card telling me?